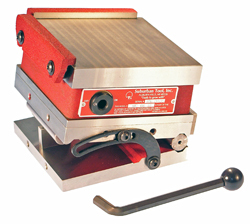 SineSet PERMANENT MAGNETIC SINE PLATES by Suburban Tool, Inc.
A removable handle, a locking strap, and two rails are included with each chuck. A locking strap and two self-storing, hardened & ground rails are included with each SineSet® sine plate. 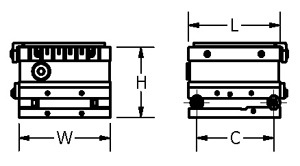 Models with the suffix "S0, S1 or S2" are part of the SineSet® System. 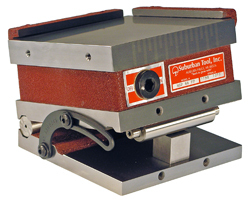 The chuck can be removed, allowing the individual use of both the sine plate and magnetic chuck and allowing other products with the same part number suffix to bolt directly to the sine plate (for compatibility chart click here). 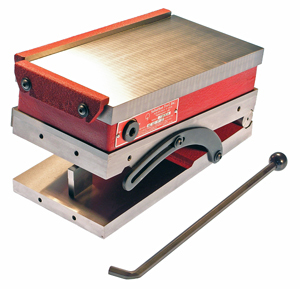 The sine plate portion is made of steel, hardened to Rc 58-60.